How and why are Earth's climate and the environment changing? How and why does the Sun vary and affect Earth and the rest of the solar system? How do planets and life originate? How does the universe work, and what are its origin and destiny? Data is imperative to answer these questions effectively. Each division within SMD produces, examines, and catalogs significant amounts of data to reinforce scientific objectives and provide scientific findings and data to millions of people. The use of space-based observatories and related assets is the hallmark of all four areas of NASA’s SMD. 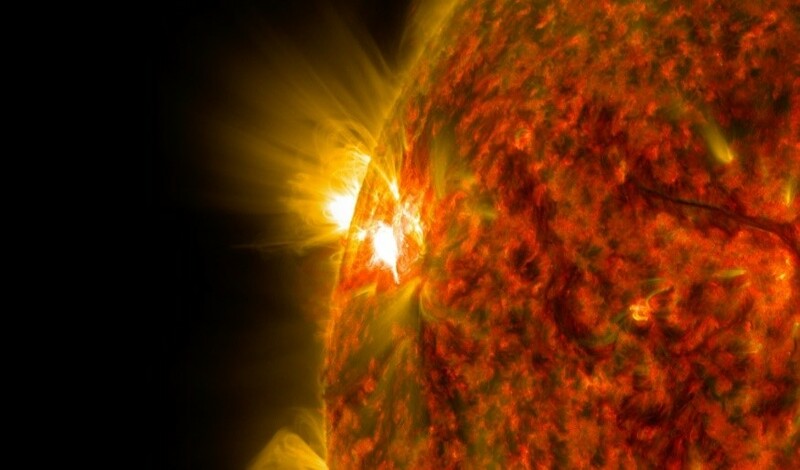 An active region on the Sun erupted with a mid-level flare Nov. 5, 2014, as seen in the bright light of this image captured by NASA’s Solar Dynamics Observatory. This image shows extreme ultraviolet light that highlights the hot solar material in the Sun’s atmosphere. Within 5 years, all SMD divisions are predicted to generate more than 100PB of data annually. The expected increase in the Directorate’s archival needs presents opportunities for cutting-edge scientific discover as well as noteworthy challenges in data analysis, management, and access in the future. SMD seeks to take a more strategic view of its science data systems, including high-end computing, to promote more efficient and effective data management across SMD divisions, as well as enable cross-disciplinary discovery and analysis of science data. The purpose of the Science Data Archives list is to provide NASA Science data stakeholders with a comprehensive list of NASA Science data archives to increase data accessibility. Earth, heliophysics, planetary, and astrophysics observations and data are freely accessible to all, including NASA’s many partners in the United States, international organizations and governments, the scientific community, the private sector, and the general public. These partners rely on NASA’s expertise in developing and launching missions, analyzing the data, and calibrating and validating results to ensure that the information is accurate. To find additional NASA Science data resources, the Science Data Resource Guide as well as participating in the SMD-funded Citizen Science projects is available to all. NASA Science data enables anyone to embark on ground breaking scientific discovering, as we collectively seek to answer some of the universe’s most pressing questions. We live on a dynamic, living planet. Land shifts. Seas rise. Volcanoes erupt. Storms rage. Snow melts. Plants grow. Cities expand. These ever-changing, interconnected systems affect all life on Earth, and the planet itself. To understand these natural and human-caused changes, NASA’s Earth Science Division (ESD) uses unique global observations from space, air, sea, and on land. This data enables informed decision-making for agriculture, water and food security, urban planning, disaster preparedness and response, transportation, climate and weather, and myriad other things that benefit society. Among the Earth systems, ESD studies from space are: dust storms, volcanoes, flooding, coral reefs, night lights, sea surface salinity, wildfires, vegetation, urban growth, food production, mosquito tracking and other human health issues, precipitation across the world, hurricanes and typhoons, soil moisture, land and sea ice, and changes to the land and sea surfaces. See the Earth Science Data page for more information on earth science data archives. The Earth Science Data Point of Contact is Kevin Murphy. Heliophysics research works to determine the nature and dynamic interactions of the Sun, the heliosphere, the plasma environments of the planets and interstellar space. This research relies on observations – as well as models based on such observations – from a fleet of strategically placed NASA spacecraft, known as the Heliophysics System Observatory. The data from these missions are publicly available through the Heliophysics Data Portal. In addition to data, related documentation, tools and services are also available to the community. The collection of data and their associated resources are termed the Heliophysics Data Environment, or HPDE. See the Heliophysics Data page for more information on heliophysics data archives. The Heliophysics Data Point of Contact is Jeff Hayes. Astrophysics seeks to understand the universe and our place in it. Astrophysics investigates and examines the creation of our universe, the full histories of stars and galaxies, exoplanets, dark energy and dark matter, the Big Bang, black holes, and more. We are discovering how planetary systems form and how environments hospitable for life develop, perhaps to learn that we are not alone. Astronomers study celestial phenomena by making observations across the electromagnetic spectrum. Space astrophysics data collected from NASA’s flight missions includes that from observations in gamma-ray, X-ray, extreme ultraviolet, ultraviolet, optical, infrared, and microwave wavelengths. NASA’s astrophysics data archives ingest and curate the data. Specialized archives also include catalogs and data services that collate and cross-correlate astronomical data and information on exoplanets, extragalactic objects, stars, galaxies, and nonstellar objects. NASA also maintains Astrophysics Data System, an archive of bibliographic literature. See the Astrophysics Data page for more information on astrophysics data archives. The Astrophysics Data Point of Contact is Hashima Hasan. Understanding the planets and small bodies that inhabit our solar system help scientists answer questions about its formation, how it reached its current diverse state, how life evolved on Earth and possibly elsewhere in the solar system, and what characteristics of the solar system lead to the origins of life. Planetary science examines the inner solar system, outer solar system, and small bodies in the solar system. Inner solar system bodies are rocky, unlike the gas and water giant planets of the outer solar system, outer solar system bodies consist of four “gas giants” Jupiter, Saturn, Uranus and Neptune and small bodies in the solar system include comets, asteroids, the objects in the Kuiper Belt and the Oort cloud. Planetary data archives include data on atmospheres, geosciences, cartography and imaging sciences, navigational and ancillary information, planetary plasma interactions, ring-moon systems, small bodies, and other planetary science related data. See the Planetary Science Data page for more information on planetary science data archives. The Planetary Science Points of Contact are Rebecca McCauley Rench and Meagan Thompson. NASA's High-End Computing (HEC) Program maintains a comprehensive set of resources and services for the agency’s four Mission Directorates, the NASA Engineering and Safety Center, external collaborators, and the nation. By closely partnering with each Mission Directorate, the HEC Program addresses their specific resource requirements and user needs. Mission support includes ensuring reliable remote access for a user community spread broadly across NASA centers and partner organizations nationwide. See the High-End Computing page for more information on High-end computing. The High-End Computing Point of Contact is Tsgender Lee. Citizen Science is defined as a form of open collaboration in which individuals or organizations participate voluntarily in the scientific process in various ways. Citizen science projects are science projects that rely on volunteers, often referred to as "citizen scientists". Citizen scientists collaborate with NASA scientists by formulating research questions, conducting experiments, collecting and analyzing data, interpreting results, making new discoveries, and/or developing technologies and applications. Current NASA Citizen Science Projects span the Science divisions. Some of the projects include the Globe Observer, which invites people to make environmental observations that complement NASA satellite observations, Stardust@Home, which invites volunteers to help search for interstellar particles recovered by NASA's Stardust mission, Aurorasaurus, which asks volunteers to report sightings of aurorae and Backyard Worlds: Planet 9, which asks volunteers to study images taken by NASA's WISE mission, to look for new brown dwarfs and planets in the outer solar system. Interested proposers are encouraged to read SMD Policy Document SPD-33 , to join the Sciencing with NASA Facebook group, and to join the NASA Solve Listserv. For more information and examples, go to the Citizen Science page. The Citizen Science Points of Contact are Kristen Erickson and Marc Kuchner. To continue to be on the forefront of groundbreaking scientific discovery, NASA Science is developing a new SMD-wide Strategic Plan for Scientific Data and Computing that will be implemented across the four Science divisions. The Science Data Management Working Group (SDMWG), a team comprised of representatives from each of the SMD divisions, is working to make Science data more accessible. Archives Processing and Data Exploitation Meeting over the course of two days in August of 2018, brought together members of the science community at NASA’s Glenn Research Center to discuss archives processing and data management. The workshop’s primary goal was to bring thought-leaders from Earth Science, Astrophysics, Heliophysics, Planetary Science, and High-End Computing together to discuss similarities, differences, and challenges that each division faces to help shape SMD’s strategy around scientific data and computing. Workshop on Maximizing the Scientific Return of NASA Data held in Washington, DC on October 30-31, 2018, brought together thought leaders from academia, industry, and government to gather community input on a new, whole-of-SMD approach that leverages advances in information technology to enable groundbreaking scientific research and help shape SMD’s strategy around scientific data and computing. Request for Information (RFI): Strategic Plan for Scientific Data and Computing was open from September 2018 – November 2018 to solicit suggestions to assist in the development of the strategic plan from key stakeholders, including but not limited to members of the scientific community, academic institutions, other government agencies, the private sector, professional societies, advocacy groups, the general public, and international collaborators. The summaries of the responses were coalesced into a report.